I know you’re tired of yelling at your kids. This handout can help you release some of your anger using proven tips that work. Look over the tips and pick out one or two that you might want to try. When you find yourself getting angry try out the tips you picked out, or head to your handout and find a new tip that you can easily do. 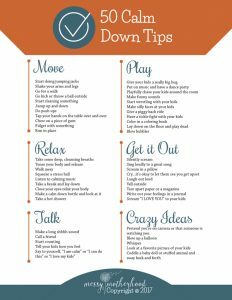 Some tips are relaxing tips (like taking deep breaths), some tips are bit more quirky (like having a dance party), but they all work. Try them out and find a few that work best for you.